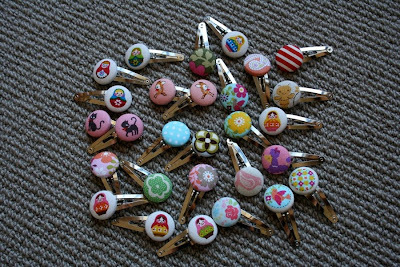 I have been oohing and ahhing over button hairclips on Etsy for a while now, and last month finally got around to making my own. 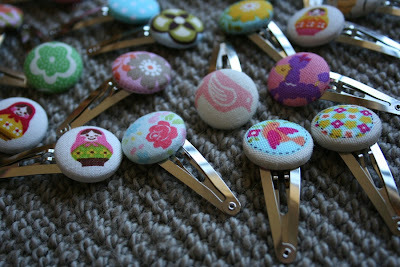 My 22 month old daughter is now the proud owner of about 30 new clips as I had so much gorgeous fabric to use. I suspect she may well add several more to her collection as I find more cute fabric. I also intend to make her matching button clips and ties whenever I make her a new dress or skirt. These are FANTASTIC, I'm having some serious hairclip envy! You are AMAZING! Hi there, I came to you through Quilt Home's newsletter. How fun! I was picked last month and was so surprised. I love these hair clips! Do you sell them? They are adorable! Your blog is great! I'd love for you to visit mine when you get a chance.